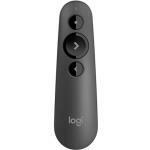 Logitech R500 Expert Reviews - Read Reviews and Buy Smarter Online. Logitech R500 Dual Connectivity Wireless Presenter, Red Laser Pointer, Bluetooth. Verdict: Works well to advance slides in PowerPoint with the associated USB dongle, and as a basic laser pointer. It's a good size, it fits in the hand well. With just three buttons for advance, back, and laser, it's easy to use.